My personal experiences in the kitchen are often filled with stress, panic and, if I’m lucky, sometimes accomplishment. I cook because I have to and not because I particularly enjoy the juggling act of chopping, frying and generally timing everything going on around me just right. Last year Overcooked managed to capture that feeling of anxiety perfectly while also turning it into a brilliant multiplayer co-operative experience – one that truly tested the relationships of those you played with. Less than one year later and developer Ghost Town Games are back with its hopefully delicious second course, Overcooked 2. 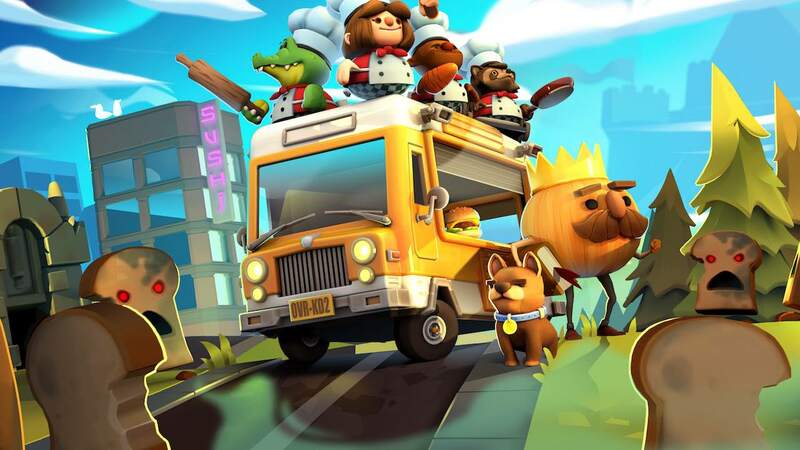 Overcooked 2 is a cooking game played either on your own or with up to four players co-operatively. Played from a top-down perspective each stage revolves around preparing, cooking and dishing up as many meals as you can in a timely manner while also dashing about and contending with a whole range of surreal obstacles within the kitchen itself. What it comes down to is good task management and if you’re playing in a group then even stronger communication is needed if you ever want to get food delivered on time. Each dish has its own list of ingredients and methods of preparation. For example, a simple salad requires no cooking whatsoever. Instead, you simply need to chop a lettuce and tomato and throw them onto a plate. Of course dishes grow in complexity. Burgers need the meat chopped and fried into a patty on the grill then placed in a bun sometimes with lettuce or cheese, while cakes need all of their ingredients blended together and baked. There’s a good selection of dishes to prepare in Overcooked 2 each one keeping you on your toes. Despite the range of things you’ll need to deal with in the kitchen, controls are kept simple with most key actions handled using just the A or X Button whether it’s picking up and dropping down items or chopping away. A dash can also be performed at the press of the B Button – a great way of getting around quicker but also annoy other players should you knock them out of the way. New to the sequel is the ability to throw, which is a minor addition but one that allows you to be more efficient in preparing dishes. The number of stages you’ll come across with gaps between particular sections of the kitchen make this skill essential especially if you aim to achieve the biggest target scores. Quite simply this is a great addition to your repertoire of moves. Much like the original Overcooked that saw you training up to take on a giant spaghetti monster called the Ever-Peckish, the story here is just as silly and just as amusing. This time, King Onion has found a cookbook promising culinary greatness, only for it to instead raise The Unbread (get it) in a scene rather cheekily channelling the horror classic, The Evil Dead. After a failed attempt to defeat the new threat involving freshly prepared salads, your brigade of chefs must travel the world learning new recipes and improving your culinary skills. Fans of the original will feel right at home here, the format of the game’s Story mode largely unchanged. You’ll drive a bus around a world map, tackling kitchens one by one involving a series of outlandish locations and increasingly tougher recipes. Each stage has three score targets to try and meet, the highest yielding you a three-star ranking. These go toward unlocking more areas of the world map. Just like the previous game, the Story mode acts as a great tutorial for newcomers introducing new mechanics at a smooth rate. If however like me you played a lot of the original then you may find things a little easy going especially for the first two worlds. In fact, my wife and I never failed to get anything lower than three stars – perhaps a result of already being practised in the fine art of Overcooked. We were still having fun, but just didn’t feel pushed in terms of difficulty. Kitchens evolve in complexity taking you to a range of locations that quite frankly would be dangerous to host a kitchen within. These include hot air balloons, mines and even a raft floating downriver. The layouts of each differ, some involving conveyor belts with a supply of ingredients rolling by or even splitting the kitchen into two with hobs on one side and cutting boards on the other. Occasionally you’ll also come across stages that dynamically change – one early example involves a hot air balloon that crashes into another kitchen where not only the layout changes but also the dishes required too. These stages offer some of the biggest highlights, requiring you not alter your preparation technique as the kitchen itself changes. It’s the combination of changing recipes and kitchens that keeps you on your toes. Just when you feel like you’ve nailed a certain dish the game will task you with now washing the dishes too or even throw another more complicated recipe your way altogether. Overcooked 2 does suffer in a few areas. As much fun as I was having with the game, I couldn’t help but feel like things were maybe a little too overly familiar. While that isn’t necessarily a bad thing, it may disappoint those expected some bigger changes for this sequel. This also isn’t a game I’d recommend if you’re looking to play on your own. While perfectly playable (the game has you switch between two chefs controlling one at a time) it’s nowhere near as much fun as sitting down with some friends and yelling and laughing as you try to work as a team. Online is an option but again thanks to a lack of voice chat it simply cannot compare to the antics of local play. The game’s visuals are bright, bold and colourful the environments taking you to some truly unexpected places. The chefs too are also a highlight each one cute in appearance and some even going so far as to venture beyond the human species – eventually unlocking a squirrel, alien and even a robot. Those keen to jump straight into the action or simply brush up on their culinary skills can do so in the game’s Arcade mode. Here you simply choose a theme and the game will place you in a random stage for you to tackle. Versus mode also makes a return splitting the chefs into two teams and then having them compete to see who can deliver the most finished dishes. If you thought all working together as one cohesive unit was manic then Versus adds another layer of chaos to the mix as not only do you now have two teams trying to work together separately but also players are even able to interfere with each other and their food. It’s a nice alternative albeit one sure to end in shouting.